I’m in the market for a very good, precise square. I’d also like a miter square. I’ve been using a 12” hardware store Stanley combination square for years to set up my cuts and I think it’s responsible for a lot of problems in my work. For example, I went to build a shooting board today, and realized I have nothing I trust to set it up perfectly square or for 45. I haven’t been able to glue up an accurate picture frame right off my chop saw. I have a little 3” Starrett but it’s not long enough for a lot of things. Willing to spend maybe $100 per piece. Any recommendations? I see some nice looking Bridge City stuff on eBay. Starrett. Will start true and stay that way after we are both long gone. Have you checked it to see if it is square or not? To check it lay it against a straight edge (edge of you table saw is good. Draw a line flip the square over and line up against the line. If it is in line with the square you are good if it doesn’t line up. then Your not square. To check it lay it against a straight edge (edge of you table saw is good. Draw a line flip the square over and line up against the line. If it is in line with the square you are good if it doesn t line up. then Your not square. It fails that test. It’s “pretty damn close” but not perfect. I’d say off a fat 32nd” over the 12” blade. Lee Valley sells good quality squares of many types. Perfectly square squares are hard to come by. I have a 12” Starett that I paid $90 for and even it is off just a smidge. My most accurate square is a really old Stanley and I’m not even sure where it came from or how I got it. 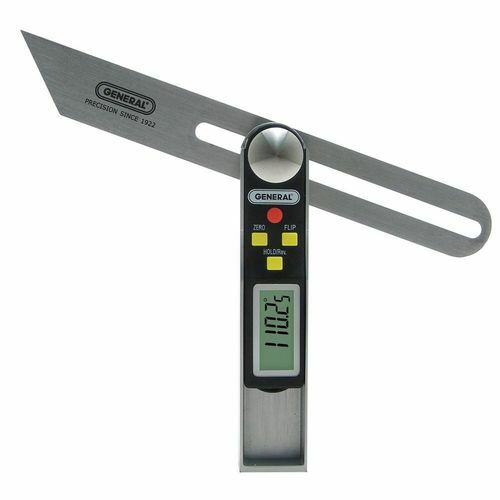 We have an inexpensive General Tools digital angle gage, and even though it has a plastic body, it’s very good. The problem is that even with 0.05 degree resolution, you will see that as a gap on the square test described above. At some point you just have to say good enough. 123 blocks can be had at discount machinery tool outlets and they are about as close to dead on as you can get without spending big bucks. Forget about fancy super expensive tools. Cheap drafter’s plastic 45-45-90 and 30-60-90 triangles are the best option in many cases. At least they are very accurate. I have the 8” and 12” squares from Bora that are dead square. They are like $15 or something. The design is clumsy though for some work. However, I do trust them for checking square, and as a bonus, if one hits the floor and is toast, who cares. I got a Woodpecker 6-4 on sale for cheap, and it’s very nice to work with. I’d love the 12” one, but the Bora is good enough considering the cost of the Woodpecker. I limped along with cheap Sears/Stanley squares for too many years and thought anything better was unnecessary. Then I got an old Lufkin combo square and it ruined me. Since then it’s been a steady decline into Blue Point, Brown & Sharpe, and Starrett. The Blue Point (Snap-On) is made in Taiwan and is a high quality tool but unfortunately something has gone wrong and it went out of square. I’ll have to look into fixing it or maybe just sell it. Recently got my first Starrett squares and they really are the very best, oozing quality, especially the forged heads. But the Brown and Sharpe are a close second, their only detriment is the edges are left a bit sharp making it less comfortable to hold. Not a deal breaker, 60 seconds with a file and all is well. What you get for your money: a square that is square, that has outstanding fit and finish. A rule made of hardened tool steel with photo etched numbers and lines that are inked and easy to read. Don’t forget to ad a drafting triangle or 2 to your list. Drafting triangles are accurate and cheap. Colored ones are easier to see. I remember reading an article written by a well-known woodworker recalling his days as an apprentice. The master craftsman made all of his tools himself, with one exception, a Blue Spruce try square. I thought, good enough for me. Then I looked at the price and moved on. If you want the most gorgeous try square and don’t care what it costs, get one of the Blue Spruce squares. For me, if it’s square, that’s good enough. First of all, for woodworking you don’t need the precision of a machinist’s square. You can’t work to those tolerances in wood. Second, It is easy to check the accuracy of a square. Just set it up on a straight edge and scribe a vertical line. Then flip the square over and see if the line aligns with the square edge. If it does, the square is square! Personally, after 60+ years of machining and woodworking, I use a Harbor Freight combination square for both. I have checked it and it is SQUARE. I’m the type who has (recently) developed a zero tolerance attitude towards any tool that is less than awesome. So I very appreciate quality and thoughtful design. I’ll look into Starrett, Browne and Sharpe, and Woodpeckers. All look good. What’s your tool of choice for 45 degree layout? For example building a miter shooting board? Just the combination square? Seems the short fence on those are problematic. I’m liking the Woodpeckers – even though looks a little goofy IMO.